Today is one week of taking the colloidal silver. I started out taking the three a day instead of working my way up. No ill affects at all. My neighbor had five very large swollen spider bites on her thumb, I put a little colloidal silver on a bandage for three days, all that was left was five little dots. Her four year old daughter came running up to me in my driveway asking me what was on her forehead. She had one huge bug bite, a little on a band aid, the next day it was flat with one little dot in the middle. And with me after just three days all the tartar was gone. I saw in your post, the same thing with you. It's amazing, usually when I have a bit of tartar built up, I use baking soda for about a week to get rid of it. I'll keep you updated with anything else I notice. 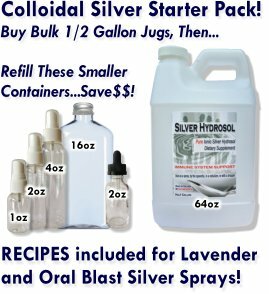 Many times we've heard that our colloidal silver hydrosol helps remove tartar from teeth. And in my own case, when I go for routine cleanings, often I'm asked if I'm using a special toothpaste.